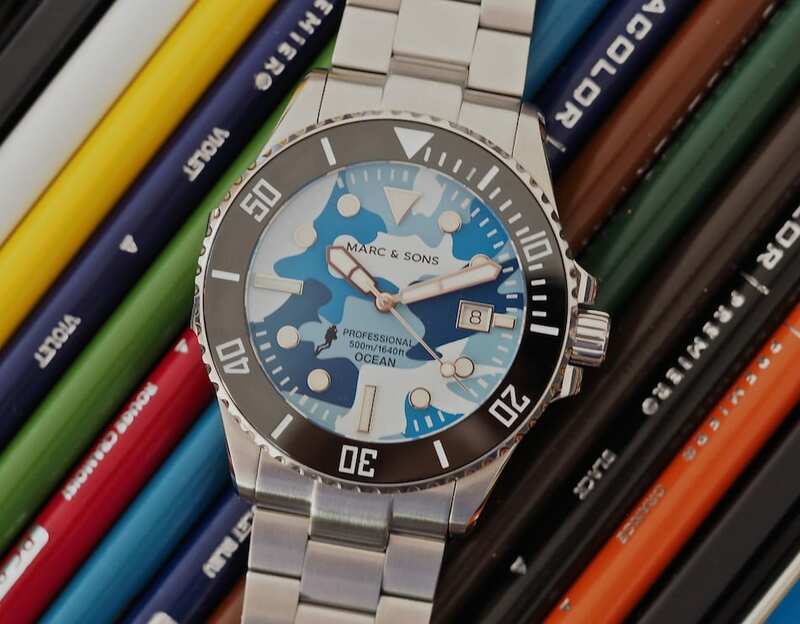 Today, we’ll take a look at the Marc & Sons DWFB Limited Edition, the newest collaboration watch between a micro-brand and the Diver’s Watches Facebook Group. As you can certainly see, this is a different, more whimsically styled, type of watch versus past pieces from the group that now boasts over 47,000 members. On the other hand, you’ll see that it contains some fairly impressive specs that make it a serious tool watch in hiding. The Marc & Sons DWFB Limited Edition comes from the German brand founded in 2006. 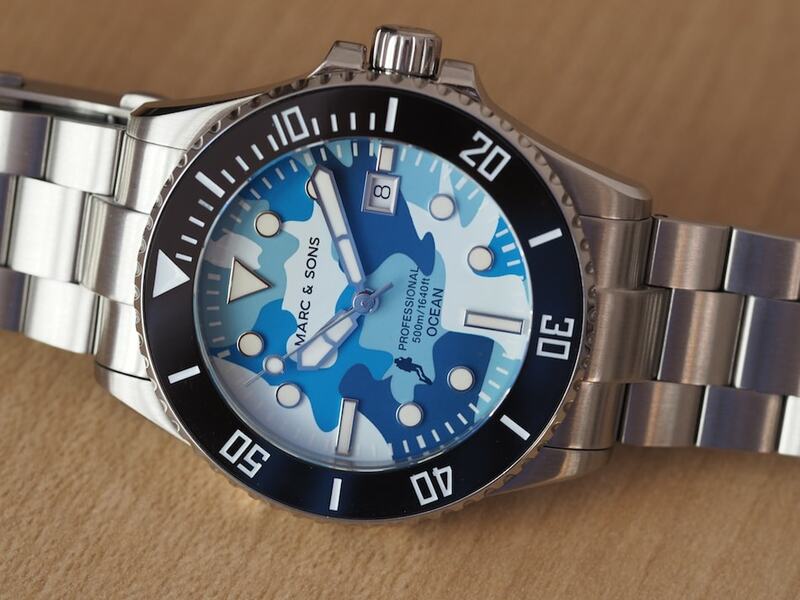 They advertise themselves as providing high-quality watches at affordable prices. Their large catalog of tool watches, including this piece, all state that the watches are “Made in Germany”. Apparently, the assembly of components, testing and final inspection occurs within the Fatherland. The Marc & Sons DWFB Limited Edition is available in one of 5 dial hues, but all are rendered in a camouflage pattern. Whether you’re up for sneaking around in the snow, brush, forest, or desert, this watch likely has you covered. For testing, we went hands-on with a prototype of the “Arctic” version that contains some blues and grays on the dial and I have to admit I like it. We’ve seen plenty of camo-dialed watches over the past several years from companies such as Sinn and even Audemars. I’ve never disliked them, but I found them way too playful for daily wear and especially at “one-watch” price levels. 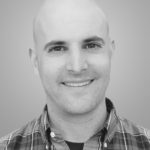 When we discuss pricing, this watch at least makes a real attempt at offering something quality-driven at a more approachable cost. Like a lot of smaller branded watches, the Marc & Sons DWFB Limited Edition is packed with value. 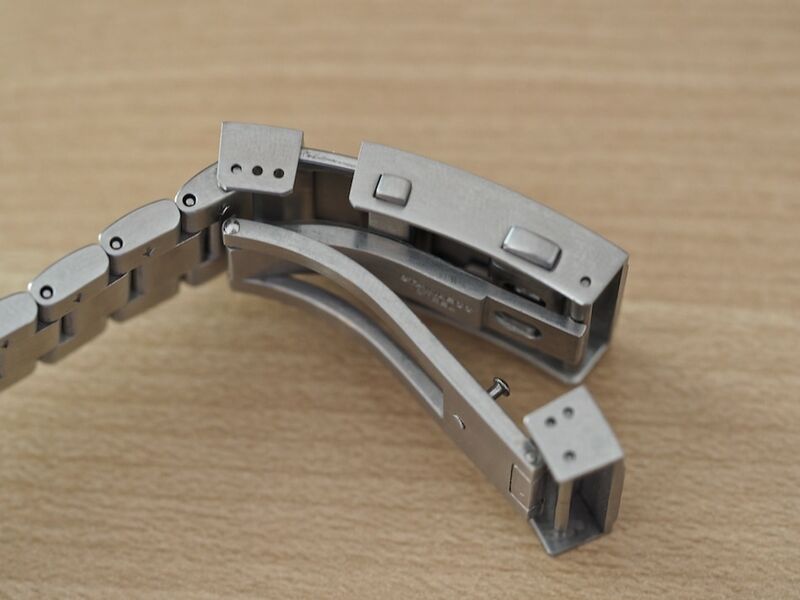 Credit the extensive, and well-developed, supply base that exists in Southern China for offering parts that look and feel better and better as new watches are introduced. Per example, we have a case that exhibits really nice finishing and little of the “slab-sidedness” we often see from smaller companies. For sure, the protruding feature at 9:00 that houses a Helium valve helps break things up, but it does look good. The ceramic bezel also shows well and tells us that there’s little excuse for anyone to screw this up any more. Things like the engraved case back (the production model will feature a chameleon in reference to the camouflage) and screw-down crown are also well executed. 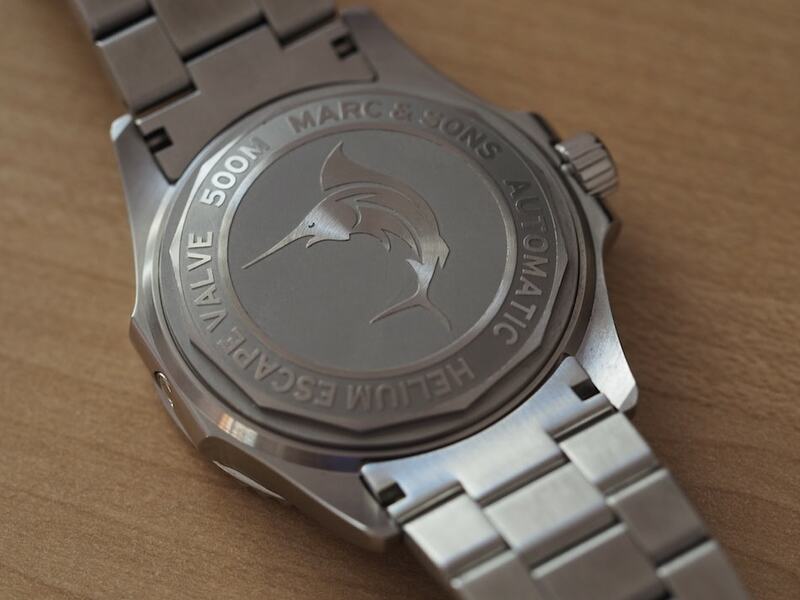 As for other specs, the Marc & Sons DWFB Limited Edition boasts a sapphire crystal, 500M of water resistance, and the use of Superluminova BGW9 on the dial. 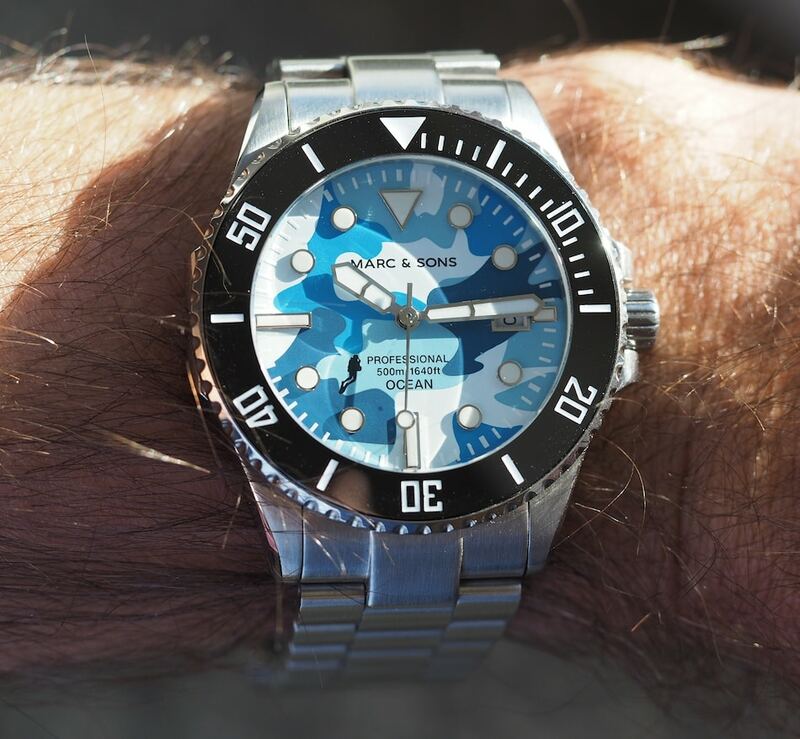 Underneath the dial, and in a bit of a change from their normal dive watches, Marc & Sons chose to use the ETA 2824-2 in this watch. 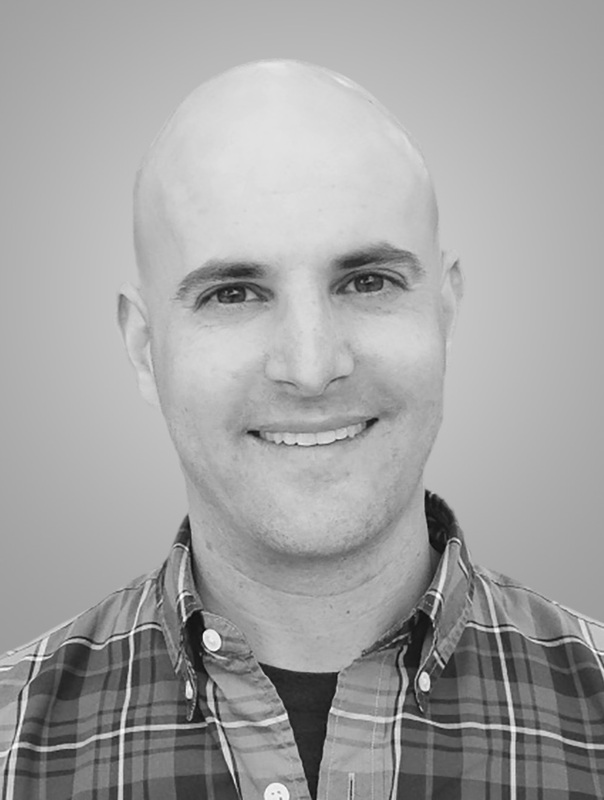 Whether we overvalue the use of an ETA or not, hearing that one is inside of a watch is a little like coming home. Reliability and serviceability are just some of the reasons for feeling good about having such a timekeeper on the wrist. You’re likely familiar with the specs, but as a reminder, 40 hours of power reserve, a frequency of 28,800 bph, hacking, and a quick set date function are just some of the ETA’s attributes. At 44.5mm in diameter and 50mm in length, the Marc & Sons DWFB Limited Edition won’t fool anyone as a small watch. Still, at only 13mm thick, it hugs the wrist nicely and doesn’t wear as large as some other DWFB-related watches we’ve reviewed. Of course, having somewhat of a Rolex-esque style makes it once seem familiar when on the wrist. That bezel look and the big chamfers on the lugs cement the familiar view. 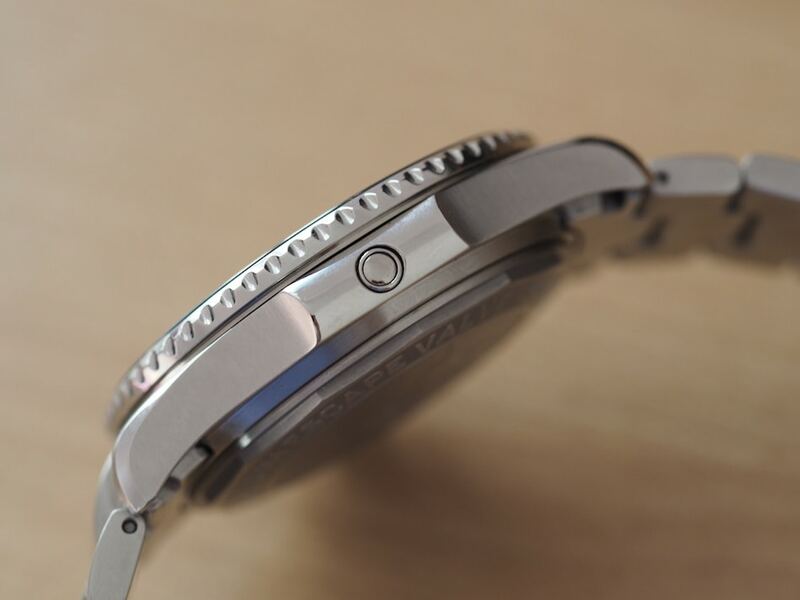 The 22mm wide bracelet on the Marc & Sons DWFB Limited Edition is nicely done with button-actuated releases for both the wetsuit extension and the main opening. It seems to be the same design as used in the recently reviewed Boldr Globetrotter, which is fine. I do wish it were tapered towards the buckle, though, as it makes for a relatively heavy feel. As for criticisms, I have only a couple things to mention about the Marc & Sons DWFB Limited Edition. First, it was a trick to my eyes, but because of the nature of the camouflage pattern, the applied indices can look a bit crooked. There’s nothing wrong with the watch, but if you’re a symmetry freak it can be a bit disconcerting. 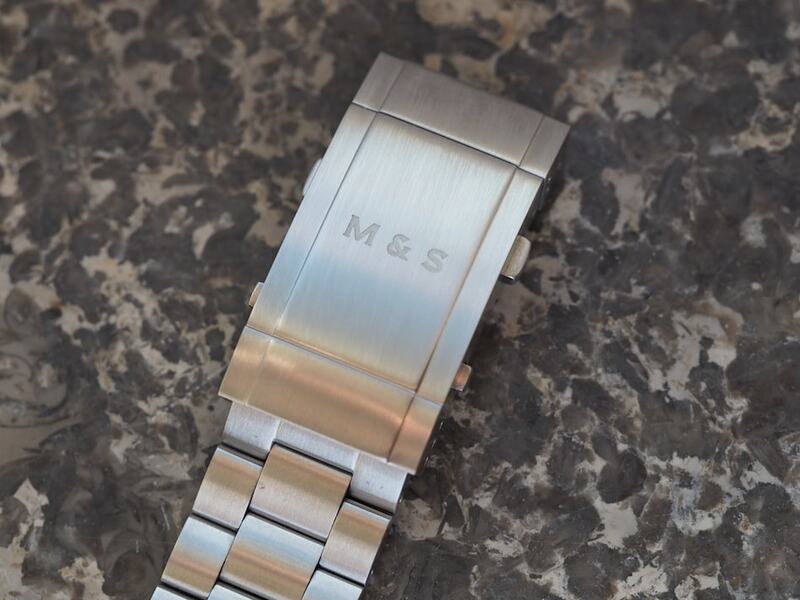 Second, Marc & Sons abbreviates its name with “M&S” on both the crown and the clasp. There’s nothing wrong with this, but I can guarantee you that 100% of people within the UK would think that this is a Marks & Spencer watch because the longstanding retail store uses the same name. It’s not really an issue per se, but it hit me immediately. At 495 Euros (add another 19% for the taxman within the EU), the Marc & Sons DWFB Limited Edition certainly doesn’t qualify as cheap, but it does come as a value-laden package. 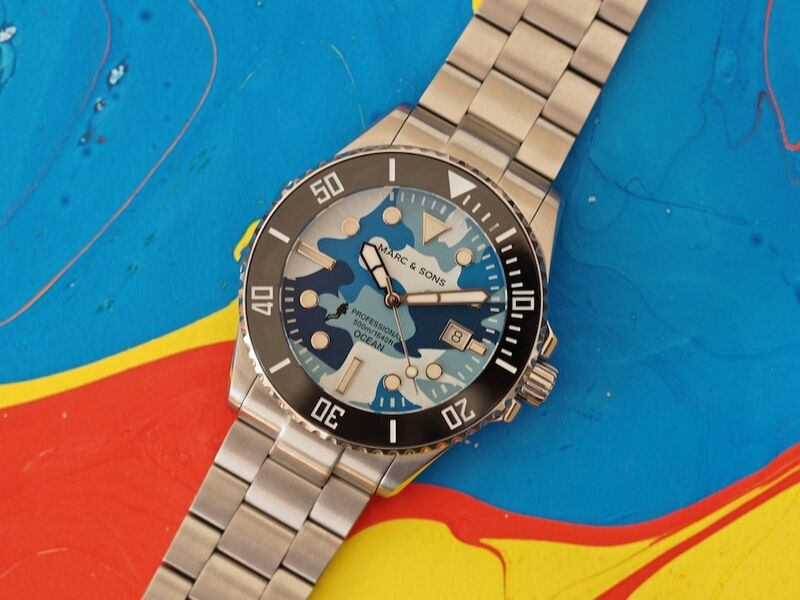 The ETA movement, the materials chosen, and the better than average finishing make it an attractive watch if you’ve considered buying a stylish camouflage watch. I could see one choosing something like this for a fun weekend watch, for a beach vacation, or even to walk around within one’s “Naughty By Nature” parka (I spied a picture of Robert-Jan sporting such a jacket in white just the other week). 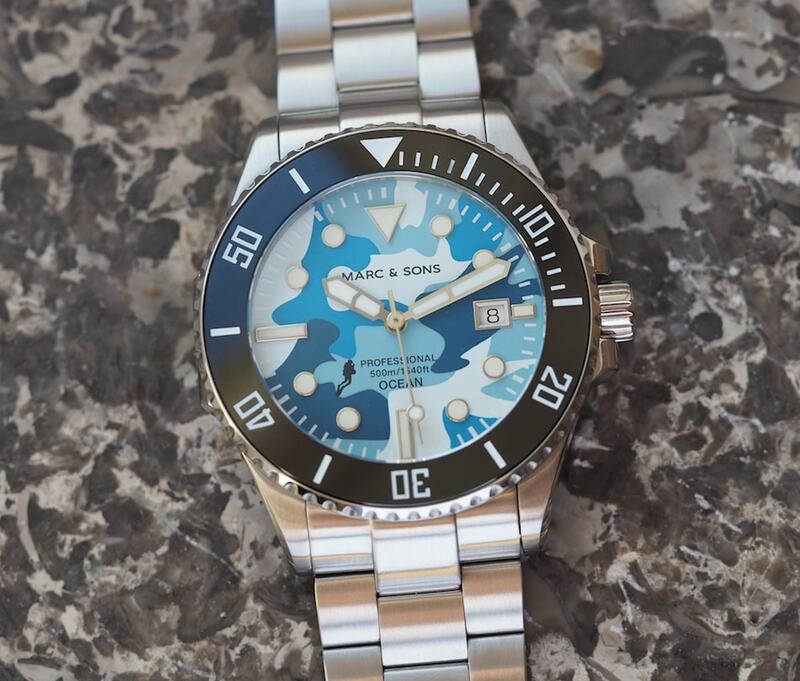 Again, the watch is fun and I am quite confident that M&S will find enough takers to fill its production run. Speaking of production, the Marc & Sons DWFB Limited Edition will be made in a run of 300 pieces across the five colorways. The number of each color will depend upon orders received. The watches are planned for March 2019 delivery. 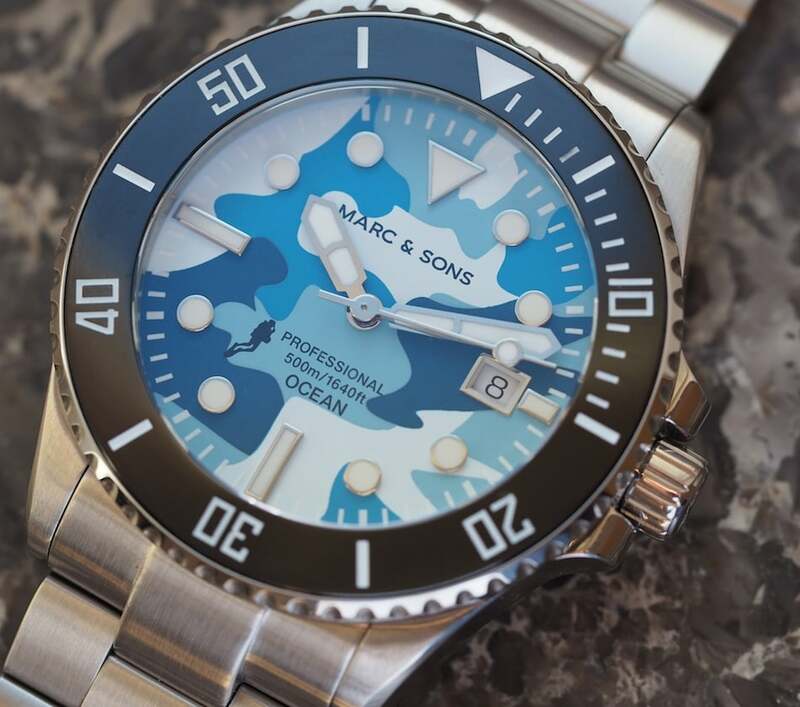 For further information on the watch and how to order, head to the official Marc & Sons site here.